Electronic Frontier Finland (Effi) presented the Finnish Big Brother Awards of 2013 on Saturday, November 9th. This year, the Big Brother Gala was held at the former Katajanokka Prison in Helsinki. The recipients of the awards were selected by a jury from nominees suggested by the public. The jury members this year were journalist Hanna Nikkanen, professor Matti Rossi, Chairman of the IT Section of the City Board of Helsinki Otso Kivekäs, and film director Jon Sundell. The Big Brother Awards are based on the concept created by the UK-based Privacy International. The international tradition started in London in 1998, and awards have been presented annually in approximately dozen countries. The purpose of the awards is to draw attention to violations of privacy. The Prime Minister of the UK has shown exceptional integrity as a politician by dismissing without comments the accusations towards his country's intelligence agency, and focusing instead on condemning useless revelations by naughty journalists and harassing their spouses. The Prime Minister must also be honoured for his country's brilliant insight that "influenc[ing] a government ... for the purpose of promoting a political or ideological cause ... falls within the definition of terrorism" . - Jorma Ollila: Promoting satellite tracking of cars. When the chairman of the board of the second largest oil company in the world showed up to lead a Ministry of Transport working group on car taxation, it was surprising news. It was, however, a project with significant synergies, as the workgroup under "Ollila the Oil" ended up recommending shifting the focus of taxation from fuel to the use of roads and simultaneously, as a by-product, creating a huge database of people's movements which can then be utilized, for example, to track down citizen activists and journalists critical of Shell. Here, Jorma Ollila has clearly shown similar foresight as when he hired Stephen Elop to lead Nokia and replaced Meego with Windows as the operating system in Nokia's phones. - Police database administration and aims to increase the amount of information registered by using the data from the passport fingerprint database and even the car satellite tracking system, despite the fact that the latter exists only on the drawing board. These projects brilliantly show how the police has understood that all citizens are potential criminals and how the police has invested in methods of all-encompassing surveillance of citizens. As it can never be known what activities will be eventually considered criminal, the only solution is to collect as complete information as possible about everything anyone ever does, and for this a fingerprint database of all citizens and a system that tracks car movement under the auspices of taxation are excellent tools. - Global telephone operators and Internet service providers: Globally treading on citizens' rights and enabling NSA surveillance. The role of telephone companies in spying on citizens draws less attention than, for example, the co-operation of social media companies with intelligence agencies. With the award, we wish to point out that without the successful co-operation of telephone companies with corrupt regimes it would be so much more difficult to tread on the human rights of citizens. The operators are also due for more reward due to how innovatively they have proactively utilized money from intelligence agencies to build a global system to spy on citizens, for example by assisting in capturing the traffic at optic fiber switches. 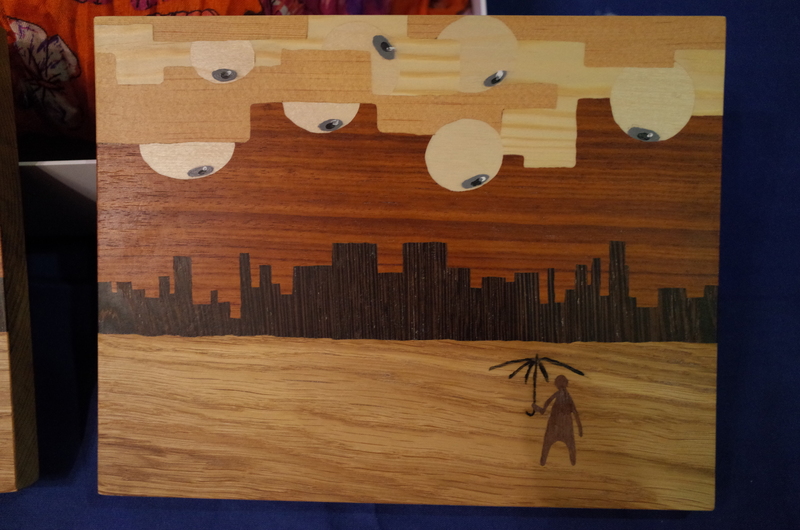 Additionally, two positive Winston Smith Awards were given. One award went to Chelsea Manning (ex Bradley Manning), former U.S. soldier who was sentenced to decades in prison for revealing U.S. military information to Wikileaks. Manning beat commander of the Finnish Defense Force, General Ari Puheloinen, who was nominated for his suggestion that military intelligence should be legislated to be under parliamentary oversight. 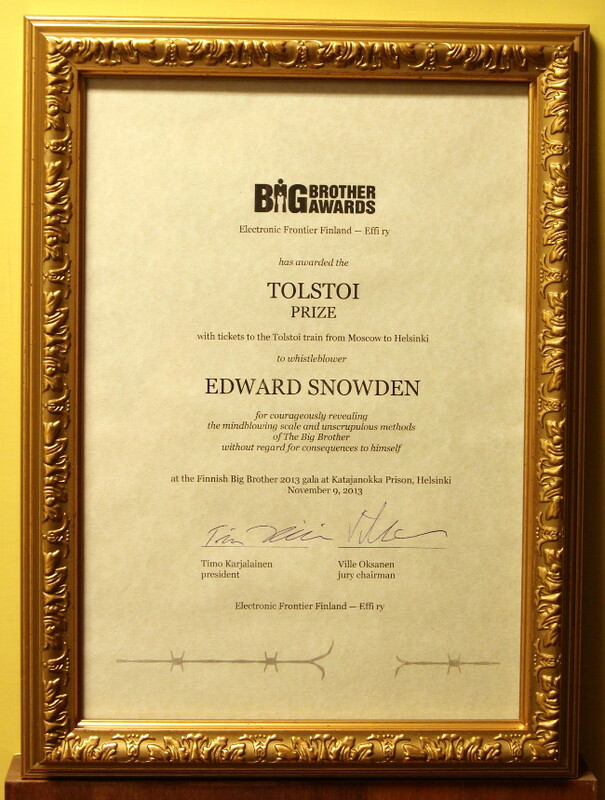 The other Winston Smith Award was given, as a special Tolstoi Prize, to Edward Snowden. The Tolstoi Prize includes tickets to the Tolstoi train from Moscow to Helsinki. Snowden, too, received his award for his revelations, which unveiled the real extent of the unscrupulous spying and eavesdropping by U.S. and other intelligence services. Effi had requested information from Finnish telecom and network service providers about queries for user identification from authorities, such as who used a given IP address at a certain time. The results were presented at the Big Brother Gala. Effi received responses from Microsoft, Sonera, Elisa, DNA and Suomi Communications Oy. The three largest phone and Internet service providers Sonera, Elisa and DNA each receive 6,000 to 10,000 queries annually. The operators do not, however, keep statistics on which authority the queries came from or which section of the law the query is based on. This is a significant problem for analyzing the queries. None of the large Finnish operators were immediately ready to take into use a practice of regular reporting of authority queries, like Google, Microsoft and Twitter already do. The Guardian: "Metropolitan police detained David Miranda for promoting 'political' causes", Nov. 2nd 2013. Electronic Frontier Finland ry has been founded to defend the digital rights of citizens. These include for example the right to uncensored communications, reasonable use rights on purchased digital content, and the right to develop and publish open source computer programs. The association raises discussion and aims to influence, among others, legislation regarding freedom of speech and copyright in Finland and in Europe. We think privacy must not be violated, spam should be forbidden, and software idea patents cause more trouble than benefits. The assocation has approximately 1500 members. More information on Effi's web pages at www.effi.org.